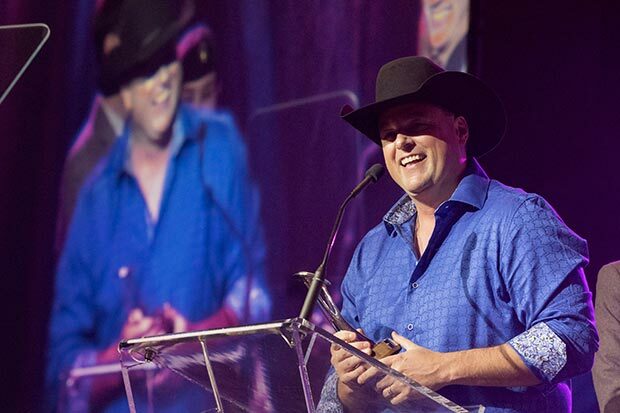 (Toronto, ON – September 15, 2016) – The Country Music Association presented twenty-four time CCMA Award & two time CMA Award winner Gord Bamford and renowned Canadian radio show host Paul McGuire with CMA International Achievement Awards Saturday during the CCMA Gala Dinner and Awards in London, Ontario. Bamford received the Jeff Walker Global Artist Award, which recognizes outstanding achievements by a Country Music artist originally signed outside of the United States in both furthering the popularity of Country Music and bringing attention to the Country Music format in their foreign-based territory. McGuire was presented with the International Country Broadcaster Award, recognizing outstanding achievement by radio broadcasters outside the U.S. who have made important contributions to the development of Country Music in their country. “The CCMA Gala Awards event was a wonderful forum to present two prestigious CMA Awards to our very deserving Canadian recipients. These Awards from CMA are a vital and symbolic tribute to the hard work and dedication applied by these individuals as they go above and beyond in the interest of propagating the Country Music format around the globe,” said Ted Ellis, Harbour Media Partners President, CMA Board member, and CCMA Chairman. CMA International Achievement Awards are voted on by CMA International Membership as well as a panel of domestic U.S.-based industry. Winners were announced earlier this year. Through various initiatives including these Awards and other special events including the international expansion of the CMA Songwriters Series (Belfast, Dublin, London, Paris) and involvement in the popular C2C concerts since 2013, CMA seeks to recognize and empower its global membership and Country Music fans around the world.